Having a professional corporate presentation at your disposal is essential to companies nowadays. As a graphic design agency we are happy to realise a practical design to provide a professional presentation for your company. Whether that is a PowerPoint presentation, PowerPoint template or Keynote presentation. At AltoAlto, you’re always at the right place at the right time. Before we design a presentation, we make sure we know the full purpose of the presentation and who the audience will be. In this way we can meet your objectives the best we can. As soon as we’ve collected that information together with the content of the presentation, we start designing. It’s as simple as that! A professional corporate presentation gives you the best first impression you can get. Especially when you have a strong story to tell, both verbally and visually. Yet, creating such a practical presentation is very time consuming. It is a lot more work than you initially thought. 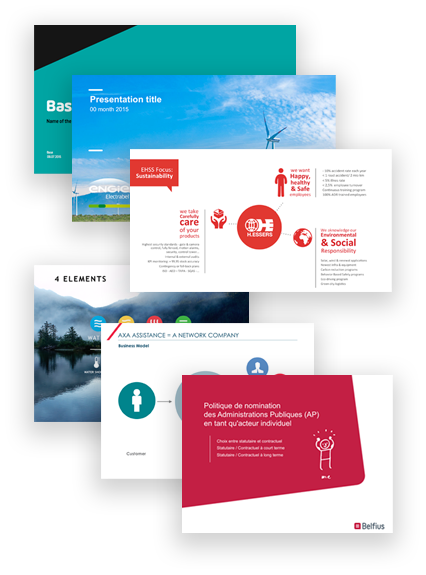 Do you think that designing a professional presentation can be more efficient? Yes, for sure! As a graphic design agency with top designers, we are happy to design your corporate business presentation. In this way, there remains more time to properly prepare the core message instead of the correct colours and shapes to choose from. Moreover, our experienced designers create the most professional PowerPoints and Keynote to impress your audience. A collaboration with experienced graphic designers.